Biography of International Gothic Sculptor, Noted For "Well of Moses". Philip the Bold, near Dijon. Claus Sluter was the foremost trecento sculptor of his day and a leading influence in the transition from International Gothic to the more naturalistic Renaissance style. In particular, he was an important proponent of northern realism and a key figure in the school of Gothic sculpture, established by Philip the Bold, Duke of Burgundy in capital Dijon. Sluter's figures are naturalistic and expressive, and more earthly bound than idealistic. Compared favourably with Donatello and Jacopo della Quercia, his style of naturalist sculpture went on to influence a generation of realist painters like Jan van Eyck, Roger Van der Weyden, Matthias Grunewald, Albrecht Durer and Lucas Cranach the Elder - and sculptors like Hans Multscher. Sluter's most famous surviving work is the Well of Moses (Moses Fountain, 1395-1403), originally created for the Carthusian Monastery (better known as the Chartreuse de Champmol), but now housed in the Museum of Fine Arts, Dijon. Tomb of Philip the Bold. Born in Haarlem, Netherlands in 1340, Sluter's life remains largely unrecorded. It is thought that his full name may be Claes de Slutere van Herlam who was listed in the records of the stonemason's guild in Brussels about 1379. Around 1385 he entered the service of Philip II the Bold, ruler of Netherlands and regent of France. Sluter's talent appears to have been recognised quickly within Philip's service. Kathleen Morand was an artist in the Court of Burgundy, and in the preface of one of her books she commented that Sluter was "destined to become one of the great sculptors of all time". To learn how to judge plastic artists like the International Gothic sculptor Claus Sluter, see: How to Appreciate Sculpture. For later works, please see: How to Appreciate Modern Sculpture. As far as we know, Sluter spent the greatest portion of his working life, decorating the Carthusian monastery of Champmol in Dijon, of which Philip was a patron and where Philip planned to be buried with his family. The monastery became a prodigious art centre and drew artists from far and wide, including the sculptor Jean de Marville (Chief sculptor when Sluter arrived at the workshop). It was here that Sluter created his famous hexagonal fountain called the Well of Moses. Carved in stone, it was considered an extremely important artwork in its time. The six-sided well was a symbol of the 'fountain of life'. It was adorned with figures of the six prophets and six weeping angels, which Sluter took great care to depict as realistically as possible. The fountain was crowned with a crucifix and at the foot were the figures of the Virgin Mary, St John and Mary Magdalene. It was carved with great precision and then painted and gilded by the artist Jean Malouel. During the French Revolution, parts of the fountain were destroyed but some of the figures and base fortunately survived and are now housed in the Museum of Fine Arts, Dijon. 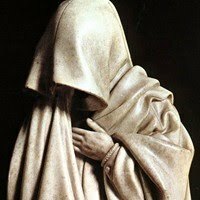 Sluter was also responsible for creating other sculptures for the Carthusian monastery, including those of Philip and his wife, and a tomb for Philip (now restored and reassembled in the Museum of Fine Arts). 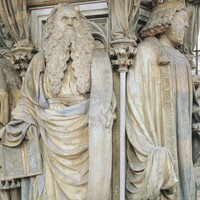 According to court archives, Sluter succeeded Jean de Marville (on Marvilles death) as Chief Sculptor to Philip in 1389 and in 1395 he bought his nephew Claus de Werve to Dijon to assist him on his works at the monastery. His nephew would go on to succeed him as Chief sculptor after his death. Although Sluter designed and completed the architectural portion of the Duke's tomb by 1389, it was only to be fully completed 11 years later by de Werve. Some historians like to minimize the part played by Sluter in this famous tomb, attributing the overall design to Marville and the sculptures on the base to de Werve. Others claim it is completely the design of Sluter. As it is, only some of the figures on the base remain, three are lost, and three are in the Cleveland Museum of Art and one is in a private French collection. The tomb would serve as a model for artists who sculpted tombs throughout France. Assuming (fairly safely) that Sluter did design the figures - they were completely innovative for their time - no two figures are alike, some are openly expressing their sorrow, while others contain their grief, some are robbed in heavy wool, other in lighter garments. They are truly unique. Sluter was an innovator in plastic art. Contemporaries of his time, such as Andre Beauneveu were still creating works according to prevailing tastes for graceful delicate figures. Sluter pushed the boundaries; his figures are expressive, real and voluminous. He has often been compared favourably to figures in Italian Renaissance sculpture, such as the Sienese artist Jacopo della Quercia (c.1374-1438) and the Florentine genius Donatello (1386-1466) who only came on the art scene several decades later. Sluter died in 1406, two years after his patron Philip.